The entire universe is within our body.What is inside will appear outside.The pure soul or light of consciousness is infinite,neither male nor female or God and the external symbol of the soul is Mount Kailasha which means Chrystal or The Soul in Sanskrit. Ramayan is an allegory written very intelligently based on an historical event.The more you meditate,the more you understand Ramayan. All terminologies used in Hinduism is derived from the name of a Moksha realized saint or free soul.Hanuman and team were aborigines of Southern India living in forest as mentioned by Swami Vivekananda who used to take data from Akashik records. Vanara in Sanskrit can mean one of three things. vana nara meaning humans living in forests; va-nara meaning humans with monkey like tails.Van => Ban = forest Vanara => Vanachara => Vanjara => Banjara Vanjara = Banjara = The men who moves in the forests.Rama took a vow that all the Vanara or aborigines of Southern India must be protected and they were given full protection.People in Southern Indian forest used to wear short dress around the waist just like Hanuman is wearing in the picture.The women also wore a short top and short dress around the waist which can be seen from the excavations of Southern India where God and Goddess are wearing similar dress. Priety Zinta wears the dress of the Aborigines of Southern India.Societies which are spiritually advanced do not lay stress on women clothing. 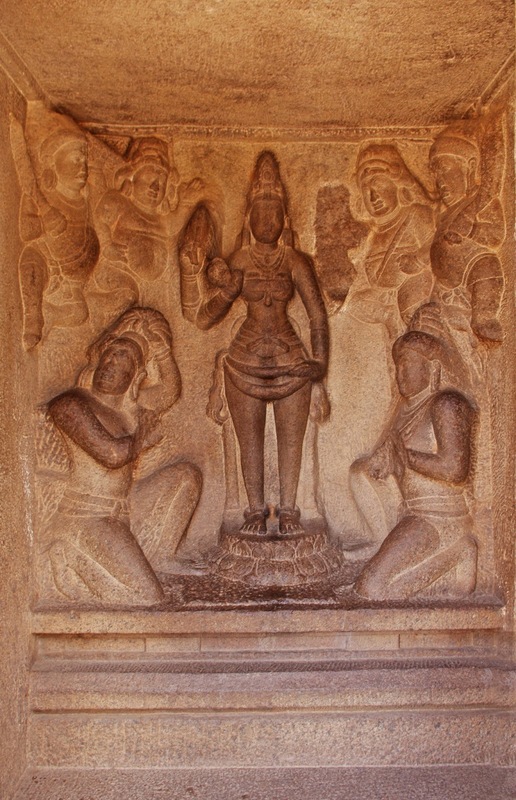 Pervert,unspiritual and mentally backward society have always tried to control women clothing more than their own lust.In Jain culture,The great Mahavira and all his male and female disciples were naked but Indian society was spiritually so advanced that they never bothered.Meditation lead to infinite love,deep respect for everyone,purifies your mind and eliminates lust. When un-realized people make spiritual Television serials,they fail to do a through study of the religion.The Aryans (Hindu)did not know who were the inhabitants of these wild forests. In those days the forest tribes they called “monkeys”, and some of the so-called “monkeys”, if unusually strong and powerful, were called “demons”.Since Ravana was strong and powerful,he was called the demon king. Rakshasha were humans during the time of evolution and were huge in size and ate raw meat.Some like Ravana were intelligent while others were not intelligent.All the characters who took part in Ramayana were Moksha realized people or free soul including Ravana. They played their role on earth as Saint Valmiki,the writer wanted them to play.Many people in India,worship Ravana. They are not wrong in doing so. Ravana was a Brahman which means free Soul. When we meditate,we concentrate on the breath(Hanuman) using the mantra Hare Rama.A bridge is formed in the spinal chord between the Manipura Chakra – Navel Center and The 4th Chakra, the Heart Chakra or Heart Center. This is called Rama Setu Bridge,the external symbol is present between India and Srilanka. Only after continuous practice of this meditation and burning all ignorance (ego),you see the infinite love within you or light within your heart called Rama. The origin of the word Rama is Sanskrit and Vedic.Ra means radiance, Ma means myself. Rama means ‘the light inside me’. Rama was born to Dasharath and Kousalya. Dasharath means ‘Ten Chariots’. The ten chariots symbolize the five organs of perception (the five senses) and five organs of knowledge and action (For instance: reproduction, legs, hands and so on). Kousalya means ‘skill’. Ayodhya means ‘a society in which there is no violence’. If you skillfully observe what goes on inside the body, light dawns inside you. That is meditation. You need some skill to relax the tension. Then you start expanding. You know you are here now, yet you are not. With this realization, there is a certain lightness that comes spontaneously. Rama is when the inner light shines through. Sita the mind/intellect was robbed by the ego, Ravana. Ravana had ten heads. Ravana (ego) was one who wouldn’t listen to others. He was too much in the head. Hanuman means breath(PAVAN PUTRA MEANS SON OF THE WIND OR BREATH). With the help of Hanuman (the breath), Sita (the mind) was able to go back to Rama (the source). Ramayana happened more than 7,500 years ago. It had an impact on Germany and many other countries in Europe and Far East. Thousands of cities are named after Rama. Ramallah is a Palestinian city in the central West Bank located 10 kilometers north of Jerusalem.Cities like Rambaugh in Germany, Rome in Italy have their roots in the word Ram. Indonesia, Bali and Japan were all influenced by Ramayana. Though Ramayana is history, it is also an eternal phenomenon happening all the time. Islamic festival Ramadan or Ramzan or Hindu festival Ramnaumi is the celebration of the light within the heart(Ramah). Rama \r(a)-ma\ as a girl’s name (also used as boy’s name Rama), is pronounced RAH-mah. In Hebrew , the meaning of Rama is “on high, exalted”. Biblical scholarship identifies two different traditions in the Hebrew Bible concerning the site of Rachel’s burial, respectively a northern version, locating it north of Jerusalem near Ramah, modern Al-Ram, and a southern narrative locating it close to Bethlehem. (a hill). This is the name of several places in the holy land. → The home of Elkanah, Samuel’s father, (1 Samuel 1:19; 2:11) the birthplace of Samuel himself, his home and official residence, the site of his altar ch. (1 Samuel 7:17; 8:4; 15:34; 16:13; 19:18) and finally his burial-place, ch. (1 Samuel 25:1; 28:3) It is a contracted form of Ramathaim-zophim. All that is directly said as to its situation is that it was in Mount Ephraim, (1 Samuel 1:1) a district without defined boundaries, The position of Ramah is a much-disputed question. Tradition, however places the residence of Samuel on the lofty and remarkable eminence of Neby Samwil which rises four miles to the northwest of Jerusalem. Since the days of Arcult the tradition appears to have been continuous. Here, then, we are inclined in the present state of the evidence, to place the Ramah of Samuel. → One of the nineteen fortified places of Naphtali. (Joshua 19:36) Dr. Robinson has discovered a Rameh northwest of the Sea of Galilee, about 8 miles east-south-east of Safed. → One of the landmarks on the boundary of Asher, (Joshua 19:29) apparently between Tyre and Zidon. Some place it 3 miles east of Tyre, others 10 miles off and east-southeast of the same city. → By this name in (2 Kings 8:29) and 2Chr 22:6 only, is designated Ramoth-gilead. HOW TO UNDERSTAND AN OLD SCRIPTURE WITHOUT GETTING CONFUSED? Ramayana is a allegory written by Valmiki before Rama was born and Rama had to enact it.The book has been written in such a brilliant manner that one has to become Hanuman and meditate on Rama and Valmiki to receive the direct truth in meditation for each verse.Initially concentration on the verse and meditation will take time but gradually it will become very fast.One learns how to use the nutcracker of intuitive perception to crack open the hard shell of language and ambiguity to get to the kernels of truth in scriptural sayings.We can easily travel in time and know the truth. In-fact all the scriptures in the world should be read in the same way to get direct truth from the omnipresent instead of understanding it via ignorance. WHEN IN WORLDLY ACTIVITY, KEEP ATTENTIVE BETWEEN THE TWO BREATHS, AND SO PRACTICING, IN A FEW DAYS, BE BORN ANEW. WHEN IN WORLDLY ACTIVITY, KEEP ATTENTIVE BETWEEN THE TWO BREATHS… Forget breaths — keep attentive in between. One breath has come: before it returns, before it is exhaled out, there is the gap, the interval. One breath has gone out; before it is taken in again, the gap.IN WORLDLY ACTIVITY KEEP ATTENTIVE BETWEEN THE TWO BREATHS, AND SO PRACTICING, IN A FEW DAYS, BE BORN ANEW. But this has to be done continuously. This sixth technique has to be done continuously. That is why this is mentioned: WHEN IN WORLDLY ACTIVITY… Whatsoever you are doing, keep your attention in the gap between the two breaths. But it must be practiced while in activity. We have discussed one technique that is just similar. Now there is only this difference, that this has to be practiced while in worldly activity. Do not practice it in isolation. This practice is to be done while you are doing something else. You are eating — go on eating and be attentive of the gap. You are walking — go on walking and be attentive of the gap. You are going to sleep — lie down, let sleep come, but you go on being attentive of the gap. Why in activity? Because activity distracts the mind, activity calls for your attention again and again. Do not be distracted, be fixed at the gap. And do not stop activity, let the activity continue. You will have two layers of existence — doing and being. Krishna has many names. Krishna is one of the greatest actors. He is constantly centered in himself and playing — playing many roles, many games, but absolutely non serious. Seriousness comes from identification. If you really become Ram in the drama then there are bound to be problems. Those problems will come out of your seriousness. When Sita is stolen you may get a heart attack, and the whole play will have to be stopped. If you really become Ram a heart attack is certain… even heart failure. But you are just an actor. Sita is stolen, but nothing is stolen. You will go back to your home and you will sleep peacefully. Not even in a dream will you feel that Sita is stolen. When really Sita was stolen, Ram himself was weeping, crying and asking the trees, “Where has my Sita gone? Who has taken her?” But this is the point to understand. If Ram is really weeping and asking the trees, he has become identified. He is no more Ram; he is no more a divine person. This is the point to remember, that for Ram his real life also was just a part. You have seen other actors playing Ram, but Ram himself was just playing a part — on a greater stage, of course. India has a very beautiful story about it. I think that the story is unique; nowhere else in any part of the world does such a thing exist. It is said that Valmiki wrote the RAMAYANA before Ram was born, and then Ram had to follow. So really, the first act of Ram was also just a drama. The story was written before Ram was born and then Ram had to follow, so what can he do? When a man like Valmiki writes the story, Ram has to follow. So everything was fixed in a way. Sita was to be stolen and the war had to be fought.Everyone who acted in it were divine souls including Ravan. If you can understand this, then you can understand the theory of destiny, BHAGYA — fate. It has a very deep meaning. And the meaning is, if you take it that everything is fixed for you, your life becomes a drama. If you are playing the role of Ram in the drama you cannot change it, everything is fixed, even your dialogue. If you say something to Sita it is just repeating something that is fixed. You cannot change it if life is taken as fixed. For example, you are going to die on a particular day — it is fixed. When you will be dying you will be weeping, but it is fixed. And such and such persons will be around you — it is fixed. If everything is fixed, everything becomes a drama. If everything is fixed, it means you are just to enact it. You are not asked to live it, you are just asked to enact it. This technique, the sixth technique, is just to make yourself a psychodrama — just a play. You are focused in the gap between two breaths and life moves on, on the periphery. If your attention is at the center, then your attention is not really on the periphery — that is just “sub-attention”; it just happens somewhere near your attention. You can feel it, you can know it, but it is not significant. It is as if it is not happening to you. I will repeat this: if you practice this sixth technique, your whole life will be as if it is not happening to you, as if it is happening to someone else. Absolutely Terrific post though . I mean You explained the origin of “Ramayan” , Ram setu bridge and Lord Hanuman very well . Short but good .. But want i add something in it . the point you have added are true but there are tons of other myths or view about Hindu tradition . Whether its “Ramayan” or “MahaBharat”.. or may be even “God”. But Anyway Good effort.!! !